I hope you’ve kept yourselves safe in the recent bad weather and have used the time to get an extra bit of Powertex play in. 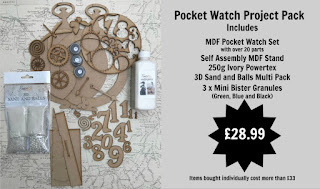 This month I’ve used the new Powertex UK Pocket Watch Project Pack to create a birthday card with a difference. I’ve made it for Granny Smyth at the age of 75 but you could create this for any age and just move the hands to different positions and use different numbers. I hope you have fun and remember to post your makes on the Powertex Addicts United Facebook page, you know we love to see what you create. To complete my piece, I used the kit along with texture paper, Rusty Powder , Yellow Bister, Easy Varnish and pigments. I mixed my bisters with a 50/50 solution of white vinegar and water to make the colours pop. 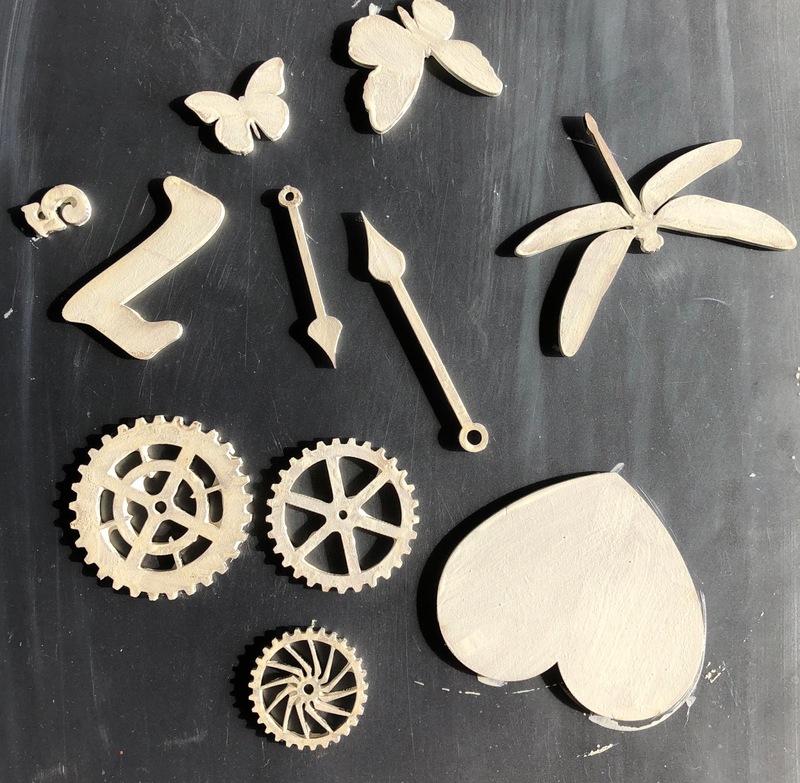 Start by laying out the pieces to see which ones you want to use. The photograph is a laser copy cut to size. Now coat the front of the base of the watch with Ivory Powertex and stick the texture paper to the centre. 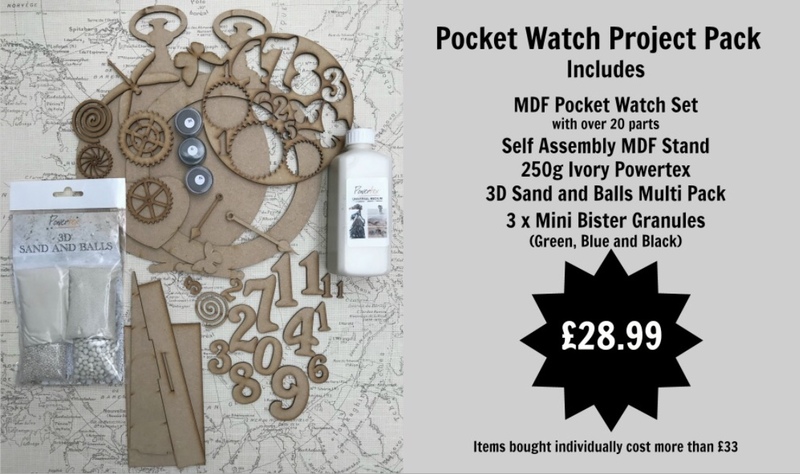 Attach the front of the watch to the back (you may need to add a little more tex around the edge then coat the front with the Ivory Powertex also. and dry with a hairdryer. When dry turn it over onto a clean work surface and coat the back with Ivory Powertex, I then used and old credit card to add texture by lying it flat on the surface and lifting it up (bit like making your snow peaks in royal icing). Spray with the blue and yellow bisters and dry with a hairdryer. By raising the base from the table whilst doing this step, it will help to stop any stray colours from seeping onto the front. When dry use a slightly damp sponge to remove the excess colour from the watch. I choose to colour my embellishments separately. Coat them all with a layer of Powertex Ivory. Randomly add extra Ivory then drop on some Rusty Powder and spray with the bister mixes, leave to dry on one side. 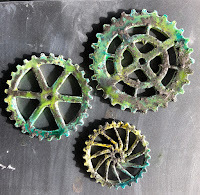 You can keep spraying these with pure white vinegar to get the rust to develop further. 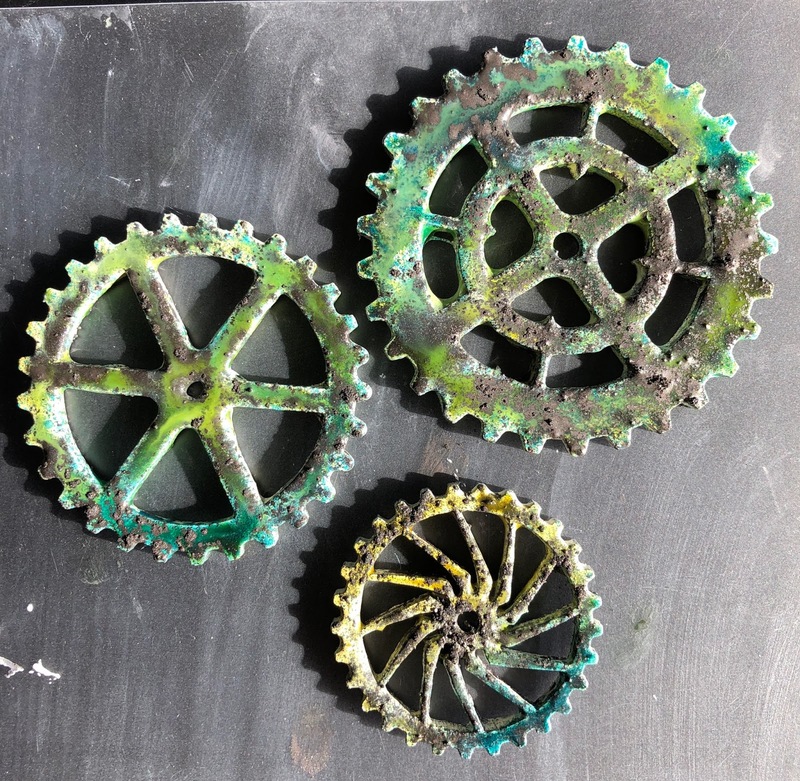 These pictures show the cogs, I repeated the same process for the other embellishments (except the heart) varying the amount of rust and colour I added. For the heart, I painted a layer of Easy Varnish over the front of the photograph, by holding the paper taut whilst it dries it doesn’t wrinkle, once dry repeat on the rear. Now using the heart as a template cut out the photograph and using the Easy Varnish attach it to the heart and coat with several layers of varnish to seal it. 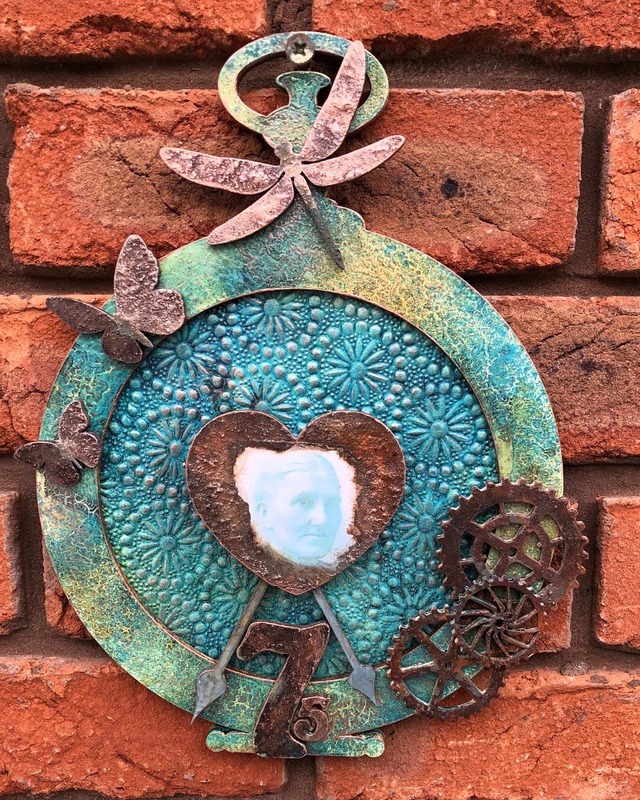 Using a paint brush apply this around the photograph then sprinkle on more Rusty Powder and spray with the bister mixes. As you can see the bister will wipe away from the photograph as you have previously sealed it with the varnish. Again spraying with more vinegar as it dries will encourage the rust to form. Now add all the embellishments to the base using Powertex, make sure you clean up any excess as you go, I used some of the spare pieces in the kit to support the heart in the centre. When it was all dry, I used a combination of Bronze Gold, Copper and Silver pigments to add a little sparkle.